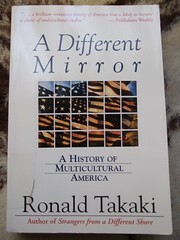 A dramatic new retelling of our nation’s past by today’s preeminent multiculturalism scholar, Ronald Takaki, this book examines America’s history in “a different mirror”, from the perspective of the minority peoples themselves. Beginning with the colonization of the “New World” and ending with the Los Angeles riots of 1992, this book recounts the history of America in the voices of the non-Anglo peoples of the United States, Native Americans, African Americans, Jews, Irish Americans, Asian Americans, Latinos, and others, groups who helped create this country’s rich mosaic culture. In this significant work of scholarship, Professor Takaki grappels with the raw truth of American history and examines the ultimate question of what it means to be an American. In the creation of our national identity, “American” has been defined as “white”. America has been racially diverse since our very beginning on the Virginia shore. Currently, one-third of the American people do not trace their origins to Europe. The transformation of Africans into slaves is the story of the “hidden” origins of slavery. There is evidence that the name Yankee came from Indian terms for the English. After five hundred years after Leif Eiriksson’s voyage to Vinland, Christopher Columbus made his crossing and changed the curse of history. The first English settlement in the New World was in Virginia, the home of fourteen thousand Powhatans. Blacks were enslaved before 1660, the very moment when the legislature made slavery de jure. Jefferson felt profoundly ambivalent toward slavery, slavery had to be abolished but when freed, blacks would have to be removed from American society. The North for blacks was not the promised land. Although they were not slaves, they were hardly free. To many white shoutheners, slaves were childlike, irresponsible, lazy, affectionate, and happy. Altogether, these alleged qualities represented a type of personality – the Sambo. Blacks viewed landownership as the basis of economic power. The Irish described their migration to America in Gaelic terms: deorai or “exiles”, dithreabhach or “homeless” and dibeartach of “banished people”. British oppresion was rooted deeply in Irish history. One and a half million Irish fled to the United States during the Great Famine. The Irish were imaged as apelike and “a race of savages”, at the same level of intelligence of blacks. Irish inmigrants women became ubiquitous as maids. Contrary to the popular stereotype and myth, these Chinese migrants were not “coolies”, unfree laborers who had been kidnapped or pressed into service by coercion and shipped to a foreign country. The construction of the Central Pacific Railroad was a Chinese achievement. The Chinese built the agricultural industry of California. The Jewish inmigrants were a highly select group. They were educated. Jewish “success” was already underway before the education of the second generation. Ironically, the very success of Jews in America seemed to fuel antisemitism. Unlike the inmigrants from Asia and Europe, Mexicans could enter and leave without passports whenever they wished. Racial competition in the workplace added fuel to social antagonisms in the neighbourhoods. World War II was the transition to the Civil Rights Revolution. Martin Luther King: “A riot is the language of the unheard”. Carta de un ex esclavo a su antiguo dueño, 1865 [ENG]. This entry was posted on Lunes, 15 de junio, 2009 a 0:05	and is filed under libros. Etiquetado: apuntes, books, english, libros, remarks, takaki. You can follow any responses to this entry through the RSS 2.0 feed. You can leave a response, o trackback from your own site.